gringa.org: Is It Spring Yet? A few weeks back, I was in New York City and had a chance to visit one of the newer yarn establishments, Yarntopia, nestled in the midst of my old haunts in Morningside Heights. Located on Amsterdam Ave and W 108th St., this yarn store would have been directly on my daily walk to school and would have put my student budget in great peril had it been open four or five years ago! The selection is fairly robust, and I was able to find yarns for all three of the projects I had in mind (more on that, below). 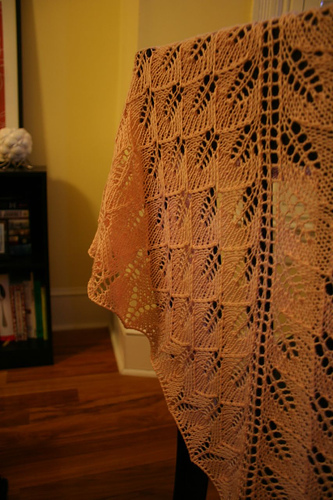 There was only one thing I was seeking, but couldn't find -- a new (to me) pattern for a triangular lace shawl. The good news is that owner was very proactive about looking through their available pattern stock for me, and was equally energetic in making suggestions and giving advice to her other customers. It's advice and suggestions delivered New-York-style (blunt, honest, and stylistically sound), which made me like it all the more. What you see above is two skeins of sage green Artyarns Ultramerino, two skeins of Blue Sky Alpaca Organic Cotton in a deep brown, and three balls of pink GGH Merino Soft. The Ultramerino will become socks and the Organic Cotton is in the process of becoming a scarf to match my new coat. The GGH Merino soft was destined for a lace shawl, which you can see was already in progress by the time I took a picture of my Yarntopia haul! The Merino Soft was great to knit with, and made this shawl come off the needles in no time at all. For the pattern, I chose Kiri (PDF! ), and it turned out to be an easy to pattern to memorize -- so this shawl was my Metro knitting for the last two weeks. This weekend I sent it off to my grandmother, who is newly relocated in Oregon after nearly 50 years in south Florida. I figured that after nearly half a century in the tropics, she might need a little something to keep her shoulders warm as she adjusts to her new climate! These pastel colors and poor photo lighting really have me pining for Spring. Are we there yet? Oooh, so pretty! Glad to hear it's easy to memorize. It's been on my list for a while. Your Kiri is lovely. I really like your yarn choice. I enjoyed knitting Kiri as well, and I like how great is looks in many types of yarn. Welcome to Oregon for your grandmother! Total sun to total clouds must be a shock! I made Kiri in a very similar color--and just today I was thinking I should just throw it on and wear it, because I loved it so but got very little use out of it! I'm sure your mom will love it. Oh, how nice of you! It's beautiful, and I'll definitely have to stop by Yarntopia next time I'm in NYC! How nice of you to knit that for your grandma! Such a nice shawl... I'm sure she'll love it! Beautiful Kiri! Perfect for an Oregon-bound grandmother! The shawl is lovely -- what a nice gift! Kiri came out beautifully. I'm impressed that you knit lace on the subway! I don't think I'd have the concentration for something like that. Sometimes the simplest patterns are the best, and they're right in front of you. Kiri is beautiful in the pale pink, and looks wonderful on your gran!